Cashback Reward : Earn up to 68$! 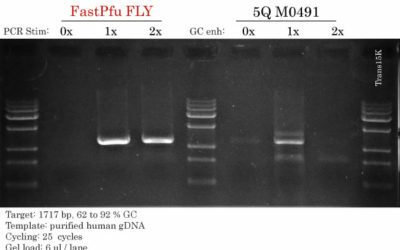 TransScrip® Green miRNA Two-Step qRT-PCR SuperMix provides all the necessary components for miRNA detection.High efficient poly(A) tail addition and first-strand cDNA synthesis are performed byTransScript® miRNA RT Enzyme Mix (containing tailing enzyme and RT enzyme) and 2x TS miRNA Reaction Mix. TransStart® Top Green qPCR SuperMix is provided for miRNA detection. This kit is suitable for detection of miRNA-containing samples like total RNA or small RNAs. Optimal ratio of tailing enzyme to RT enzyme and optimized reaction buffer, so as to ensure the efficiency of miRNA reverse transcription. 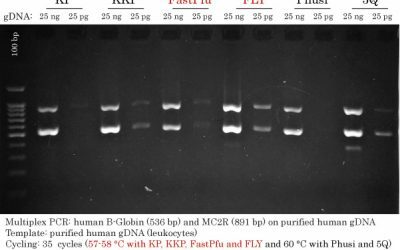 One-step completion of Poly(A) tailing addition and cDNA synthesis in one tube. TransStart® Top Green qPCR SuperMix is of powerful amplification capability, high specificity, high sensitivity and makes data accurate.